What is it about vegans and reubens? THERE ARE OTHER SANDWICHES, PEOPLE! Well, I’m guilty of reuben love, too. I’m Jewish so I’ve got a right to be. What can be better than tangy tempeh, creamy dressing and vinegary Sauerkraut? But aren’t you tired of the mess it makes!? 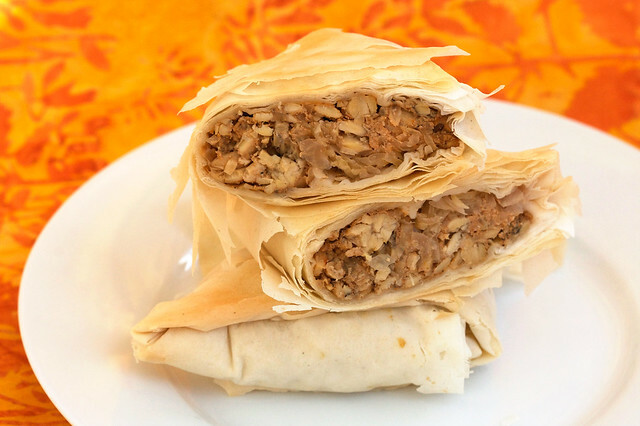 The Tempeh Phyllo Reuben revolutionizes the way you eat sandwiches! No, but seriously, I was heading to a potluck and wanted a super convenient way to transport Reuben to mouth. And the Phyllo Tempeh Reuben was born! Instead of rye bread, I threw some caraway seeds into the mix. And instead of a mayo-based thousand island, I went for a sundried tomato cashew spread that holds up to being stuffed into phyllo and baked. Of course the sauerkraut is still there holding down the fort. As with anything you have to roll up into phyllo, this can take awhile. Especially if you’re not used to working with phyllo. But it’s a great skill to have if you like to entertain, so give it a shot. And then revolutionize the way we eat other sandwhices. Phyllo PB&J, anyone? Note: You can definitely halve this recipe, but I figure you’d make these for a special occasion, so might as well make the whole batch. If you have too many they reheat well! Just place in tin foil and bake in the toaster oven for 5 minutes, or microwave in a paper towel for 30 seconds. These taste great at room temp, though, making them potluck perfect. Oh and remember to thaw the phyllo the night before! It’s no fun to have everything ready and then realize that your phyllo is still frozen. Soak the cashew in water to get them as creamy as possible. Just place them in a bowl and cover in water for at least an hour. Drain when ready to use. It’s a good idea to do this a day in advance so that it comes together quickly when you’re ready. Add drained cashews and sundried tomatoes to a food processor and pulse to chop everything up. Drizzle in water and puree until completely smooth. Place in fridge until ready to use. This thickens a lot as it sets. Crumble tempeh into bite sized pieces, place in a small saute pan and add enough water to cover, plus a splash of soy sauce (about a tablespoon). Cover and bring to a boil. Let boil for about 5 minutes. Drain and set aside. In the meantime, saute the onion in the olive oil for about 7 minutes. Add the caraway, garlic and black pepper and saute for a minute more. Toss in the tempeh and saute for 10 minutes or so, until nicely browned. Mash the tempeh a bit while you’re cooking it. Drizzle in the soy sauce and lemon juice, and mix well. Taste for salt. Remove tempeh from the pan and place in a bowl. Let it cool just to the point where it has stopped steaming. Give it a toss every now and again to help speed it a long, it should be about 15 minutes. Mix 1/2 a cup of the cashew spread into the tempeh mixture and mash it up. Taste for salt and pepper. Ok, now we’re going to form the triangles. Now, everyone has a different way of folding phyllo. I suppose there is no wrong way, so long as you end up with a triangle shape that fully envelopes the filling. This is how I do it, but you can also look up videos on how to roll phyllo triangles for visual examples that may be more helpful than written ones. One thing though, I never use as much oil as they do in those videos. I prefer a light brushing to prevent sogginess or ripping the phyllo. On with it then! Have a clean, dry surface with plenty of elbow room at the ready. Pour some olive oil into a small bowl and have a pastry brush handy. Also needed are the tempeh mix and the sauerkraut and have a large baking sheet brushed with olive oil nearby. Unwrap phyllo dough and lay it out flat. Slice the stack in half widthwise (across the waist.) A pizza cutter works great for this! Now we’re going to layer 3 sheets. Carefully place one sheet in front of you lengthwise. Brush with a little oil and layer another piece of phyllo on top. Brush with oil and layer one last phyllo sheet and brush with oil. Place 1/4 cup tempeh filling in the lower right side of the dough (figure 1). Place a dollop of the cashew spread on the tempeh (about 2 teaspoons), and a big spoonful of sauerkraut on top (about 2 tablespoons). Then fold the left side over the filling so that you have a long rectangle (figure 2). Brush lightly with olive oil. Now begin folding the triangles. Fold the lower left corner up to form a triangle (figure 3). Now fold over two more times, until you have a triangle. Tuck any extra dough under the triangle. Place on baking sheet and brush with a little more olive oil. When you think you’re pretty close to finishing all of the traingles, preheat the oven to 350 F.
Bake triangles for 15 minutes, until lightly golden. Flip over and bake for 12 to 15 more minutes. They should be varying shades of golden brown. They taste great just out of the oven or at room temp! I’m pouting right now. I’m going to make these on my own and salt them with my tears. Yeah, I guess I didn’t mention that I never actually made it to said potluck! I did get to give them out, though. Poor Lauren. Ruben & Phyllo sounds like a great combo. The sundried tomato cashew spread sounds delish. am i the only one that it’s sad to replace 1000 Island with sundried tomato spread? Yummy! Think these will make nice finger food for holiday parties! You can certainly make a 1000 Island spread. Do some capers, tomato paste, lemon, stuff like that. It’s just that it needs to be heartier to stand up to baking. I think you could make a nice thousand island dipping sauce to go with it if you don’t like the sundried tomatoes! 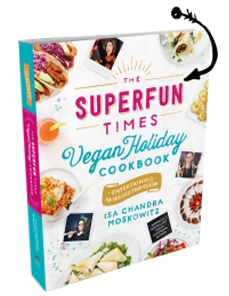 I wonder how seitan would do in this, for those of us who are soy-averse… I’ve never had a reuben with anything but tempeh before. Beautiful! Phyllo dough always make me a little weary but hell, these look very much worth the effort. Thanks for sharing doll! Do you have any suggestions for swapping out the cashews or a different sauce? (I’m working with a nut allergy.) Thanks! Made this tonight. Is it just vegan physics that each recipe out performs the last? This makes four PPK recipes made in the past week. I think I’m setting a standard for my husband that will be hard to maintain. Thanks for such well-written recipes that come out *exactly* as expected, every time! …oh, and may just have to use the remaining sundried tomato cashew spread as a body lotion. absolutely loved these – i added 8oz diced mushrooms to the filling when I was cooking it to help stretch the recipe and use all my phyllo dough. These were so tasty. I subbed tempeh with some ground up & chopped up walnuts, and crumbled tofu and extra soy sauce, (because my all my tempeh was accidently destroyed in a stealth freezer defrosting incident.) It worked well. This is the first time I’ve ever had sauerkraut and now I can’t stop thinking about it. Thanks for the recipe. 101 fast and quick **and also good! ** meals! « Lagusta's Luscious! If these don’t magically appear on my computer desk right now I’m setting this place on fire. On second thought, my landlord is a nice lady. I’ll just get some tempeh and make these for dinner on Wednesday. what kind of sauerkraut are you using?? The RAW kind?? cooked in jar kind??? I have never had a ruben, but these seem tasty! These are DELICiOUS! I just made a batch and ate three right out of the oven. Amazing! I love these! They are perfect for me to take to lunch for school. I ate a lunch of one triangle and a salad at noon today, and when I got home at 4:00pm (when I usually do my snacking) I wasn’t at all hungry until dinner at 6:00. Sure, I ate a brownie, but it was because I wanted to eat the brownie and not because I was hungry. I for my personal tastes, it could use a bit more sauerkraut and more seasoning could be put into the tempeh (actually, I used ‘veggie protein crumbles,’ as I wasn’t able to find anything labeled ‘tempth’). Nothing a bit of mustard and a few sweet pickles upon eating can’t fix, though. ^.^ I ran out of the sundried tomato and cashew spread, so next time I’ll have to make more of it. I was a bit disappointed with them, as the day after I made them the phyllo got soft. It was still very good and didn’t stop me from eating them for lunch, but I was hoping the phyllo would be a bit more crunchy. I’ll have to toast them for the crunchiness. Reuben’s are not a “Jewish” food. They are German-American. But you can totally still like them. Excuse me? Jews eat Reubens, they are a staple at Jewish delis. You obviously misinterpreted something I wrote, but thanks for your permission anyway. One account holds that Reuben Kulakofsky (sometimes spelled Reubin, or the last name shortened to Kay), a Lithuanian-born grocer from Omaha, Nebraska, was the inventor, perhaps as part of a group effort by members of Kulakofsky’s weekly poker game held in the Blackstone Hotel from around 1920 through 1935. The participants, who nicknamed themselves “the committee”, included the hotel’s owner, Charles Schimmel. The sandwich first gained local fame when Schimmel put it on the Blackstone’s lunch menu, and its fame spread when a former employee of the hotel won a national contest with the recipe. Other accounts hold that the reuben’s creator was Arnold Reuben, the German owner of the once-famous, now defunct Reuben’s Delicatessen in New York, who, according to an interview with Craig Claiborne, invented the “Reuben special” around 1914. The earliest references in print to the sandwich are New York based but that is not conclusive evidence, though the fact that the earliest, from a 1926 edition of Theatre Magazine, references a “Reuben special” specifically does seem to take its cue from Arnold Reuben’s menu. I am right now eating one of these while watching an Hercule Poirot episode with David Suchet (perfect match)…. I am delighted!!! !So savoury and spicy and everything! Thank you Isa for all that inspiration! 🙂 I replaced the phyllo by small Pita bread and placed some basil leaves on top. deeeeeelicious! First thing, never believe Wikipedia. It’s a website of lies. Secondly, Reubens are a Jewish deli classic. Thirdly, no one really knows where the Reuben originated from, the information was never documented ..there are several stories on how it got its name and where it came from. Who knew a sandwich could be so mysterious? It doesn’t really matter anyway, people all around the world enjoy the tastey sandwich, and now us vegans and vegetarians can enjoy them whether we are Jewish, German, American, or anything else. Thanks Isa, I cannot wait to try this recipe out! I found that using a mixture of olive oil, ketchup, small amount of soy sauce and balsamic vinegar, Caribbean jerk seasoning, onion powder, and turmeric, you could find a tempeh seasoning a little more faithful to the taste of pastrami. Adding the ketchup, soy sauce, and vinegar gives it some of that umami taste that you find in pastrami. I also just basted and pan fried the tempeh in the mixture. It finishes in about one minute. I experimented on about 5 different nights before I found the combo that tasted best to me. I’d eat this just about every night if I could. I’m not a vegan, so I throw some cheese on mine and they are perfect. Just stumbled upon this on Twitter and will RT and share on our Facebook and Pinterest pages. Great idea for fans of our vegan dough. Thanks for sharing. these are soooo yummmy! 🙂 but you guys never fail to impress with wonderful recipes! All that phyllo diagramming scared me… Ok I’m just too lazy… Made this but subbed thousand island dressing for the tomatoes and slapped it on sourdough because I didn’t have rye. Delish. Could these be frozen? Absolutely bright and reubenish goodness. Thank you, Isa!